MLSs, rightly or not, feel they’re under attack from the recent surge of investment capital into startup real estate technology. The Realtor organization, by extension, perceives the potential for an undermined MLS system as undercutting its role in establishing cooperation, standard governance and value to its members within the real estate industry. While there is plenty of hand-wringing and protectionist lobbying underway, there needs to be more focus on proactive value building. It’s natural for a business to fear new competitors, but its best defense is to create even more value for its customers and constituents to prove it deserves its position as an industry leader. At Real Estate Connect in San Francisco this year, I was lucky enough to sit in on a product demo with an MLS board. Homesnap, the company whose mobile app allows consumers to simply take a picture of a home with their phone and receive all kinds of information about it, was showing off its new MLS-level app. 1 – The essential industry functions that they provide are not easy to demonstrate to consumers, and are viewed as baseline services by agents who are compelled to join. 2 – They provide powerful, robust databases for listing collection and distribution, but they are often visually and functionally unappealing to members/subscribers. 3 – Brokers and agents don’t want their MLSs to compete directly with them, so public-facing portals and apps (the holy grail of public data accuracy and timeliness) are often hamstrung or denied by the members themselves. MLSs need to provide products that improve the agent-side MLS interaction, and also demonstrably generate consumer-side lead generation. This focus on reducing negatives and increasing positives is the path to agent/broker appreciation and loyalty to the MLS organization. Homesnap’s consumer app is already a top five real estate app. It doesn’t even have listings in most markets — yet. Let that sink in. The current popularity of this practically listing-free app may be the most telling sign of its consumer attraction. Users get vast amounts of data about homes in a fast and efficient way, and judging by the thousands of positive reviews, it provides a great experience. The Homesnap MLS product takes it to the next level. It allows agents to do the vast majority of their normal MLS functions from their phone in a user-friendly way. It combines the broad listing data, confidential agent notes and contact information, as well as MLS subscriber roster and sales history within one easy-to-use interface. Agents can browse the MLS and make changes, send CMAs or contact other agents just as they would from their traditional MLS setup. It’s basically the app that every agent is asking their MLS to build and provide for them. Agents can connect directly with their clients to create a closed loop of interaction for home searches and correspondence while delivering them MLS-level data from a mobile device. The road map to a truly transformative product begins to appear as you see the broad range of problems it solves. It’s a business tool for agents. It’s an outstanding consumer app. It enforces the strict data standards of the MLS, while still providing a user-friendly interface for agents and consumers. It not only saves agents time, it builds their businesses. The way the app is delivered to the consumer is the genius of the process. The app can be downloaded directly as an MLS-branded app, and the listing agents would receive inquiries on their own listings. It’s more effective, and would probably find more adoption, though, in the broker-branded model. A broker gets their own account through the MLS, and a link to download its own version of the app, which is branded with the broker’s contact information. All lead generation and inquiries through that broker’s app will come directly to that broker. Every broker within the MLS can have their own version, much like an IDX website agreement. They’re all tied in to the MLS and Homesnap directly, while the traffic and subscribers who download the apps are dependent upon the brokers themselves. You drive your own traffic to your version of the app, and keep those leads/contacts for your company. An agent/team-branded version is on its way as well. In short, brokers and agents can continue to compete with one another online as they already do, but the consumer is kept within the agent-centric MLS sphere. The difficulty for any new technology company hoping to work within the MLS space are the high fences around the organizations. MLSs are not often fast-moving organizations, and for good reason. Their members expect stability and support before flashiness and trailblazing. I’ve personally tried to introduce great companies to MLS decision-makers and felt the inertia holding outsiders back. Homesnap’s barriers to entry are probably even higher than the average technology provider’s, because they’re not merely asking to use MLS data for an agent’s public-facing product. They want to be a part of the MLS, the interface between the MLS and its subscribers. As outstanding as the product and its potential are, it’s likely that many MLSs wouldn’t be willing to take the risk on a small company being so deeply woven into their systems until they’d seen long-term results in other markets. MRIS, in the Greater Washington, D.C., market, pioneered the Homesnap MLS product and has found widespread adoption by consumers and agents, but the road to achieving a significant portion of the market will be a difficult one. As Zillow and Trulia know well, trying to woo MLSs is an unfruitful labor in many cases. That is, of course, unless Homesnap became a part of the MLSs’ most trusted industry partners. Sometimes corporate strengths align in way that seem to say, “You’d be crazy not to combine your talents.” In short, if NAR acquired Homesnap, adoption would go through the roof. Realtor.com’s app already has the most accurate database of homes in the country on a national basis, oustanding listing search tools, and agreements with hundreds of MLSs. With NAR’s ownership of Homesnap and the licensing of its technology to Move/realtor.com to fold into the same app, the MLS-level functionality and consumer photo features become a part of a single offering. The trust level of MLSs nationwide with a NAR-owned technology would be enough to make the MLS partnerships difficult to turn down. The app could be offered to Realtor-owned MLSs for free as a member benefit, or to all MLSs as a non-dues revenue builder. 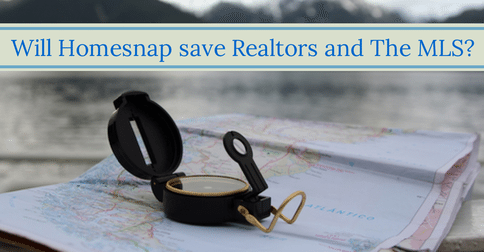 The Homesnap/realtor.com app would be a tangible value provided by NAR, and an MLS, to its members and its local consumers. A national mobile MLS app? Imagine 1 million members promoting the same app platform — a platform that already had millions of consumer users without even having a viable “for sale” listing database. Every broker would be promoting their version of the app, explaining why its listings are more accurate and faster than portal apps. Every agent would already be using the app for their MLS duties and prefer their clients to use the consumer version. Every consumer who downloads the app would be contributing to the brand awareness of a Realtor product, no matter which broker or agent led them to it. It would be millions of individual salespeople contributing to their own bottom lines while lending a unified voice of credibility to the platform itself. While plenty of data-heads clamor for a national MLS, the creation of an app that found nationwide adoption by MLSs, brokers, agents and consumers would actually prove that there is no need for one. A national platform that aggregates MLS listings in a timely and accurate fashion would satisfy the consumer need for a consistent experience. Realtor.com’s current app already does much of this. Adding the MLS functionality would allow local rules and regulations of MLSs to be integrated into the back-end agent side of the product. MLS guidelines and unique local practices could continue for agents, while the national consumer interface would be uniform. It seems that an acquisition of this kind would put the Realtor organization in the driver’s seat for mobile consumer eyeballs, bolster MLSs’ value pitches to their members, and streamline the process of agents’ day-to-day activities all at the same time. In the end, mobile app traffic is just one part of the consumer experience online. MLSs and Realtor boards still need to find new strategies to keep their members engaged, and to woo desktop, mobile Web and mobile app consumers into their agent-centric world. Keeping real estate consumers within that sphere from online browsing to closing is a financial benefit to those members within the closed loop. With a tool like Homesnap MLS in the hands of the organization, NAR could quickly become the 800-pound gorilla in the mobile real estate app space, which is growing at a much faster rate than traditional Web browsing. Homesnap would probably be very successful on its own in the long run, so MLSs would be wise to look into the product right away to see if it fits their needs. NAR/Move could build a similar product on their own if necessary. Neither of those scenarios seems palatable, though, when placed beside the potential immediacy of an actionable product in the current environment. As an official member of the Realtor organization, the realtor.com/Homesnap MLS app could be an overnight powerhouse partnership that enjoyed a massive base of distribution and promotion from its own membership. Once in a while, there’s an opportunity for an industry stalwart to do something truly dynamic and change the entire storyline of the marketplace. This appears to be one of those opportunities.